On Friday, we cited a big profit and sales beat on Foot Locker’s Q1 earnings report, noting that we have had good luck with the company’s earning chain in the past. Our designated targets were the FL 06/15 $52.50-55 Calls. Lightning struck for us once again as FL surged and our ideas took off. It was just this past Wednesday morning that we were mentioning our late April call on ARQL which allowed us to catch the stock when it was trading as low as 2.40. ARQL had, at the time of last week’s mention, breached into the four-dollar range, but after a fruitful finish to the week, we have to circle back to comment on its impressive new highs. We also want to place TNTR on bottom watch as we kick off the short trading week, after noticing that the stock has been absolutely crushed in the past week. It had already been on a steady downward trajectory, but as you can see below, the selloff really kicked into high gear just last week. We’ve also noticed a rapid rise in the short volume, accounting for more than 1.2M of the stocks total volume on Friday. 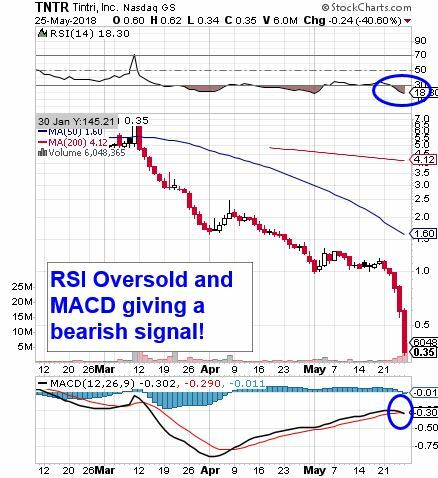 With the stock already having been egregiously oversold, this type of scenario can often lead to a short squeeze, and we will want to be ready to ride TNTR on the way back up, if that occurs. This entry was posted in Newsletters and tagged ABIO, ARQL, CVPR, FL, KTOV, LPL, MYSZ, OLED, SBOT, TNTR, VPLM by Blue Horseshoe Stocks. Bookmark the permalink.